BOULDER, Colorado - Evidence for intense local enhancements in methane on Mars has been bolstered by ground-based observations. The methane, as well as water on Mars, was detected using state-of-the-art infrared spectrometers stationed atop Mauna Kea, Hawaii and in Cerro Pachón, Chile. Scientific teams around the globe are on the trail of methane seeping out of Mars. And for good reason: The methane could be the result of biological processes. It could also be an "abiotic" geochemical process, however, or the result of volcanic or hydrothermal activity on the red planet. Many types of microbes here on Earth produce a signature of methane. Indeed, the tiny fraction of atmospheric carbon found as methane on our planet is churned out almost entirely biologically with only a very small contribution from abiotic processes, scientists say. New information on Mars methane has been acquired using NASA's Infrared Telescope Facility (IRTF) atop Mauna Kea, Hawaii, as well as from the Gemini South telescope sitting on a mountain in the Chilean Andes called Cerro Pachon. Michael Mumma, a lead investigator at the Center for Astrobiology and Solar System Exploration Division at the NASA Goddard Space Flight Center in Greenbelt, Maryland, presented the findings during the Biennial Meeting of the NASA Astrobiology Institute, held here April 10-14 and hosted by the University of Colorado, Boulder. Mumma and his research colleagues have used ground-based spectrometers to carry out a simultaneous search for methane and water vapor. "Pronounced enhancements" of methane have been detected over several equatorial regions on Mars, consistent with "enhanced local release," Mumma reported. In scientific terms, the methane line detected is "very strong indeed," Mumma noted. 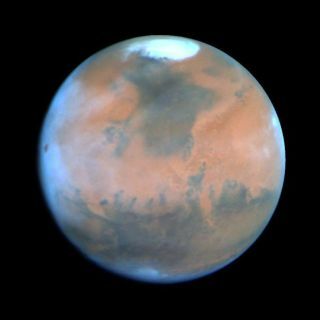 Using the high-tech infrared spectrometers, spectra of six narrow longitudinal bands across the face of Mars were taken. A spectra is an analysis of light broken into its rainbow of colors. "Every one of these longitudes shows a very substantial enhancement in the equatorial zone," Mumma explained. "So this is a very intense source of methane on Mars in this region. It also requires a very rapid decay of methane...more rapid than photochemistry would allow," he added. On Mars, the photochemical lifetime of methane is very short - roughly 300 years. Therefore, any methane now lingering within the martian atmosphere must have been released recently. Mumma said that his data - along with what Mars Global Surveyor's Thermal Emission Spectrometer measured at the same time - suggests that "a major source" of methane over Valles Marineris is evident during the fall equinox on Mars. Spotlighted at this week's meeting in terms of strong methane detection was an area on Mars east of Hellas Basin to west of Hellas Basin - and the eastern most edge of the large region where NASA's Mars Odyssey orbiter found subsurface hydrogen in high abundance. That hydrogen is thought to be the signature of water ice, scientists said. Moreover, for the first time, and using the Gemini South telescope, two lines of methane have been simultaneously seen on Mars. And when each is studied independently, they show a consistent abundance of methane on the planet -- within the narrow stripes across Mars scanned by the Earth-based gear. Furthermore, the ground-based "footprint" of data extracted was contrasted with data taken in a similar time period by the Mars Global Surveyor's (MGS) Thermal Emission Spectrometer. That Mars-orbiting MGS sensor yields information on the red planet's surface pressure and temperature, as well as water vapor within the column of martian atmosphere the sensor is inspecting. The MGS data helped validate the approach taken by Mumma and his colleagues. The new results stem from observational sweeps of Mars done in 2003, made possible by two years of preliminary work. "We had to invent several new methods for analyzing the data," Mumma told SPACE.com. "These data are extremely challenging to analyze," he said, with the scientist drawing from his nearly 30 years of work in planetary atmospheric spectroscopy. Mumma said the data collected from Earth is a step to help sort out biogenic versus primordial or geothermal origins of the Mars methane. Additional chemical tests can help constrain these possibilities, he added, but investigations from space, around Mars, or on the planet - perhaps even samples robotically returned to Earth -- are likely needed to reach a definitive answer. Next up for Mumma and the methane on Mars quest is acquiring more telescope time. Geologically alive, biologically alive...or both? Requests are in for telescope time next January, both at the IRTF and at the W.M. Keck Observatory, also in Hawaii. Using the Keck facility, Mumma said his team could look for seven different types of molecules at Mars, allowing them to chip away at the question of biological versus geochemical production of methane. Culling out from the data the release locales of methane on Mars is critical to the selection of future landing sites, "to search for organics that are either biological or abiotic," Mumma said. Finding out whether methane releases are seasonally dependent is also of keen interest, he said. There is no doubt in Mumma's mind that something is going on at Mars. "Mars was wet...was it also alive...or is it now alive?" But "alive" could be geologically alive and not necessarily biologically alive, Mumma said. "Or Mars could be biologically alive," he added. "Or maybe both. So to me that's the real issue. Now we think that Mars is not a dead planet. Even if it's just geology that is occurring and releasing this methane...that's pretty darn interesting. And the geologists are very excited about this prospect."